Mark Dodson is made of skin and bone like the rest of us, but when he gets up to leave the room the temptation is to frisk him just to see if there's a little Teflon. No matter how hard you grill him, nothing sticks. You tell him that since his appointment as chief executive of Scottish Rugby in September 2011 he has overseen 27 Test matches with a success rate of 30%. You point out that in the bread-and-butter Tests of the Six Nations his Scotland have won a lamentable 20% of the time. You remind him that Scotland recorded a miserable total of 47 points in the championship just gone, the lowest tally of any one of the six nations in 10 years and the lowest by Scotland in 20 years. You break down those 47 points into an average of 9.4 points per game and like a poker player revealing a royal flush you tell him it's the lowest average Scotland has returned in the championship for 45 years. If outgoing interim coach Scott Johnson's defensive line was as robust as Dodson's then Scotland would be the great immovable object of world rugby. He cites the progress made on his watch. A broadcast on behalf of the Positivity Party. The doubling of commercial income and the further reduced debts. The increased funding to the professional teams and the soon-to-be created regional academies in Edinburgh, Glasgow, the Borders and Caledonia. The improved relations with London Scottish and the possibilities that lie within. "We're going to invest in the schools, not just the independent schools which we've been accused in the past of being biased towards," he says. "My background is state school. When you have state schools and clubs and independent schools all playing in the same competitions you improve the standard of rugby at grassroots level. "We're investing in schools. We're going into areas where we've never been before and we're investing heavily. We're investing in women's rugby. We have some very interesting candidates as head of the women's game that we're investigating now. "If you look at the problems of Scottish rugby, they really start with the struggle to come to terms with professionalism. We're trying to right the wrongs of the last 20 years and we've had a really, really difficult time. But we're getting there." This is his mantra and he's sticking to it. 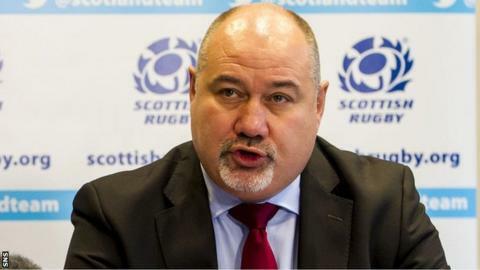 In a morning newspaper article, Alistair Gray, the noted sports management consultant, described Scottish Rugby's performance as an embarrassment with an accompanying fear of an "accelerating level of decline that will lead to international oblivion." Dodson said that he's not answerable to one person but five million people. The problem is that many of the rugby public in Scotland would probably tend to agree with Gray's analysis. Dodson rejects that. He says if he was to listen to the doubters then he would never go to work in the morning. He believes he's on the road to something and that the rest of us sceptics will catch up soon enough. "Keep the faith," he says. Keep it? To many, it was lost an awfully long time ago. When you say that people could be forgiven for thinking that he's insulting their intelligence by banging on about his World Cup-winning target, he's unapologetic. He refuses to revise it downwards. Despite the evidence of a horrendous Six Nations he holds fast to the goal of winning the Webb Ellis in England next year. "We'll soon have a new coach in Vern Cotter, one of the most sought-after coaches in Europe," he said. "We've a summer tour, autumn internationals, a Six Nations championship and then pre-World Cup games that are meaningful. We have four of those games instead of the normal two. "We're going to France, Ireland and Italy as well as playing Italy at home. "We believe we're going to develop a team that is going to be competitive. We have a whole raft of reasons why you should be positive about what we're trying to do. If you look at the centre partnership of Matt Scott and Alex Dunbar, if you look at a back three of Stuart Hogg, Sean Maitland and Tim Visser, if you look at a pack that can compete with any other pack in the world on its day, there are reasons we should be cheerful." There isn't a scintilla of evidence that suggests Scotland can win the World Cup. The very notion is so far off-beam that Hollywood at its CGI best wouldn't be able to get their head around it as a concept. "When we were in Nelspruit last summer we played South Africa and we had them in huge trouble until Jim Hamilton got yellow-carded," he explains. "We were in control of that game in their backyard. And they're in our World Cup group. They're one of the top three countries in the world. "We had France in deep, deep trouble at Murrayfield not that long ago. We think we can compete with anyone on our day." Those two games had one thing in common, of course. Scotland lost the pair of them. And more recent than Nelspruit in the summer was Murrayfield in the autumn when South Africa routed Scotland 28-0. None of this permeates the force-field of optimism around the chief executive. "You don't want the chief exec of the governing body becoming discouraged," he said. "And I'm anything but discouraged. We knew there would be ups and downs on this journey. This [the recent Six Nations] is one of the downs. You have to realise that when this team starts to win you'll find that most of the feelings of disquiet will go away. "We will deliver what we said we would deliver." He hears but doesn't agree with the criticism of Johnson, the stand-in head coach who is now directing Scotland's rugby future despite having taken the national team backwards this season. Johnson may even be on Cotter's coaching ticket as attack coach, regardless of that 9.4 points average in the Six Nations. "That's something that Vern and Scott will talk about," adds Dodson. "It's something for them to decide. They're going on the summer tour together as a transition period and when they come back off that tour they will decide themselves what they want in terms of the back-office team." The message is unrelentingly upbeat. It has to be, he says. What's the alternative? To climb down into the desperation pit with the rest of us? It's not somewhere he's prepared to go.